After a whirlwind month of SHARK filming multiple pigeon shoots in Pennsylvania, including the launching of two official investigations into criminal animal cruelty violations, the shooters are packing up and going into hiding and cancelling shoots. Please be advised that the remainder of our 2017/2018 calendar will be changing. The December 17th shoot scheduled for the Berm is cancelled. For updates, please contact Pete Streletz on his cell phone: 732-433-3989. Wishing you and your families a Happy Thanksgiving and a very Merry Christmas! 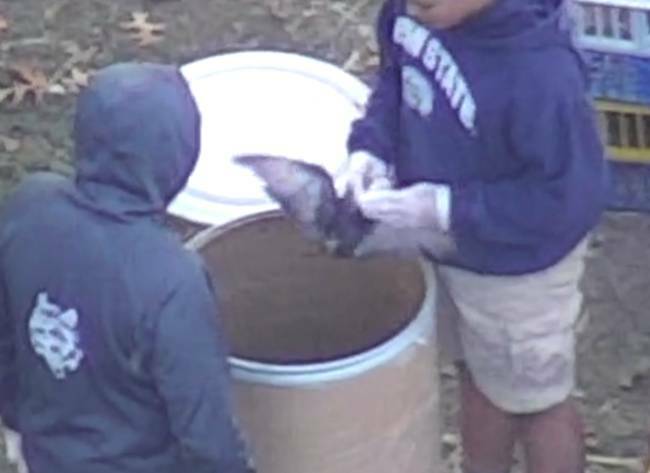 SHARK is releasing a new video showing extreme and illegal animal cruelty committed at the Wing Pointe canned hunting club in Berks County on November 11th, 2017. Why are they changing their schedule? Because SHARK has been at every shoot they’ve recently held and our newest, most powerful drone recorded devastating footage of severe animal cruelty. The shooters have no idea who, or how many of them might be charged, and their ranks include doctors and lawyers, and other very wealthy, influential people who simply cannot afford to be exposed for criminal animal abuse. This is a monumental turn of events in the campaign against pigeon shooting! Our team was once again at Wing Pointe this past Sunday, prepared to document a planned shoot, but that shoot was cancelled as well. That means the planned pigeon shoots are falling like dominoes, one after the other, and now the entire schedule is cancelled, with any new shoots to be held in complete secrecy, if the shooters can pull that off. SHARK's revitalized campaign against pigeon shoots started on October 28th, when our new drone that has unbelievable magnification abilities was put into action at the Thunder Ridge game farm in Tioga County. The never realized that an aircraft so far away could film young boys tearing the heads off of 181 pigeons, an act that is unquestionably illegal. We have since provided our video documentation to the PA State Police who have initiated an investigation. The next shoot was a three-day long event held at Wing Pointe from November 9-11. SHARK has waged a long and difficult campaign against pigeon shoots held at Wing Pointe, and all that work has clearly paid off. Not only did Wing Pointe cancel a multi-day Labor Day pigeon shoot, but the November shoot was so poorly attended that we counted no more than eight people actually shooting, one of the smallest shoots we have ever seen. Past pigeon shoots at Wing Pointe and other locations could easily draw more than one hundred people! This shoot was particularly important as it was sold as a new type of pigeon shoot, one designed to bring more people into this bloody sport. Clearly, that failed. We flew our drone on the 9th and the 11th and filmed horrific and illegal acts of animal cruelty, including living birds having their heads torn off and pigeons buried alive. No other group or individuals have done what SHARK is doing for Pennsylvania’s pigeons. Even though there are groups with millions of dollars sitting in the bank, and some of those groups are within a few miles of these shoots, only SHARK personnel, who have to travel 1,600 miles for each trip from IL to PA and back, are there on the ground - where it counts. Incredibly, some of these groups, like Humane PA PAC, have posted our victories on Facebook - such as shoots being cancelled - but they don’t mention that it was SHARK who was responsible for making it happen. Apparently they figure that if people don’t know who actually did the hard work to stop these shoots, then they won’t support the ones who are truly effective. That means we will have fewer resources to fight the battles that must be fought, and that means this battle against pigeon shoots will drag out longer than it has to. This past month is a perfect example of how SHARK works; we go to where the killing is happening and use the latest and greatest technology to not only expose it to the world, but as evidence for law enforcement. We are relentless in our fight for animals and we never give up. If you like seeing pigeon shooters running scared, pigeon shoots being cancelled left and right and thousands of animal lives being saved, then please donate to SHARK in this season of giving. A few weeks ago, we promised you that we were going to redouble our efforts against pigeon shoots in PA. We have kept that promise, and we promise you that you will find no better value for your donation than with SHARK.